In Bugles in the Afternoon, Edwards writes, “My long experience in the church has convinced me that most ministers—both professional and lay—spend time under the juniper tree. Those ministers who have served more than ten years and not been depressed, discouraged, or disillusioned can hold their annual convention in a phone booth. The rest of us, if we’re honest, will admit that we occasionally visit the juniper tree . . . .” In eight honest and helpful chapters, Edwards probes the shape of modern ministry and the stresses that plague ministers. He explores ways to survive church conflict and how to know when it is time to leave the steeple. 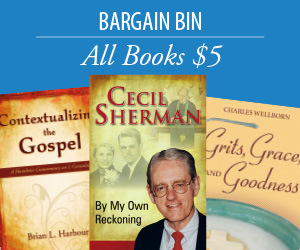 His fresh, thoughtful insights will encourage anyone trying to minister in a complex world. Bugles in the Afternoon is one juniper tree survivor guiding other juniper tree sufferers toward hope. Judson Edwards is the author of twelve books. A pastor for thirty-eight years, he now lives in Cedar Park, Texas, with his wife, Sherry, and spends his time writing and drinking coffee at Starbucks. He can be reached at judsonedwards@hotmail.com. Books on ministry usually lie. They describe only the trumpets in the morning or the cello at the end of the day. Judson Edwards helps us hear the Bugles in the Afternoon. He tells the truth about how difficult and delightful it is to serve Christ’s church. I am grateful for such an honest book on ministry. With Bugles in the Afternoon, Jud Edwards will bless and enlighten. 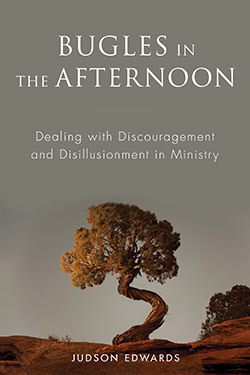 His unflinching, poignant examination of ministry will help pastors and congregational staff realize they are not alone and, despite momentary appearances to the contrary, they can not only endure, but thrive. Likewise, his transparent, honest reflection on ministry will help lay leaders understand and support the clergy they have called to lead them. Jud Edwards writes honestly, creatively, and thoughtfully about being a pastor. He’s realistic but never cynical. He offers clear guidance but never simplistic formulas. He acknowledges that ministry can be hard, but affirms that it also a source of joy.